The Sukhoi Design Bureau (OKB) was tasked to develop a long-range interceptor that would be able to contend with strategic threats as well as hold its own against the hottest air-to-air fighter being fielded in the west - the F-15 Eagle. The resulting design bore a similarity to the F-15 from afar, but that is where the similarities end. 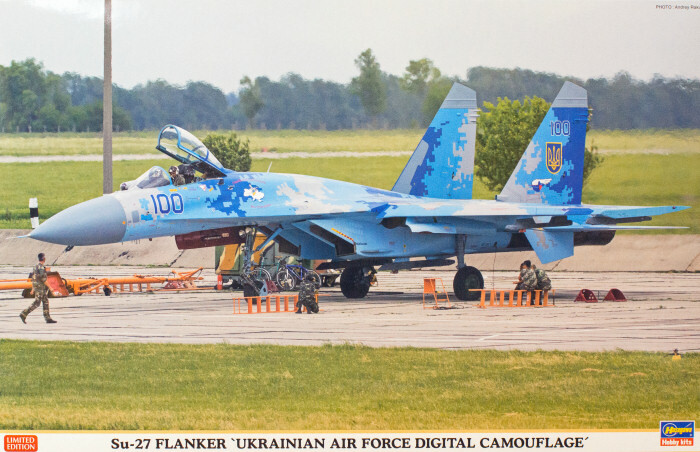 The Su-27 is more than a match for any contemporary operational fighter, save perhaps the F-22, but its younger brothers, the Su-30 and Su-35 will keep Raptor pilots on their toes. The kit provides a nice set of four-view painting and decal instructions to get this project looking right. The instructions provide the paint colors using Gunze Sangyo paint equivalents, but since Gunze doesn't produce any of these colors, the instructions provide mixing instructions. You can do that if you wish, but your life might be much easier if you use paints that are pre-mixed for this specific colors and those are available in Akan paint set 47710 available from Linden Hill Imports. If you'd like to have a unique camouflage scheme for your scale flightline, Hasegawa has made this one easy with these nice decals. Pick one up for your next project!